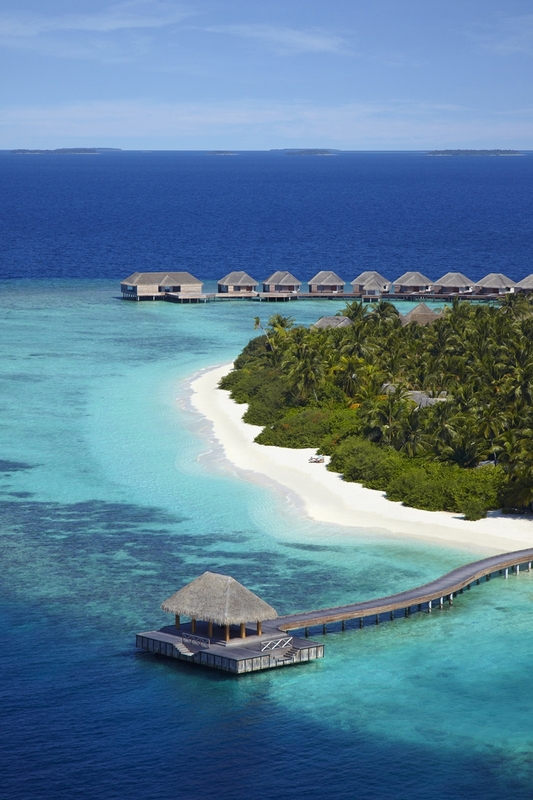 Add a piece of sublime Thai extravagance to the Maldives and you get Dusit Thani. 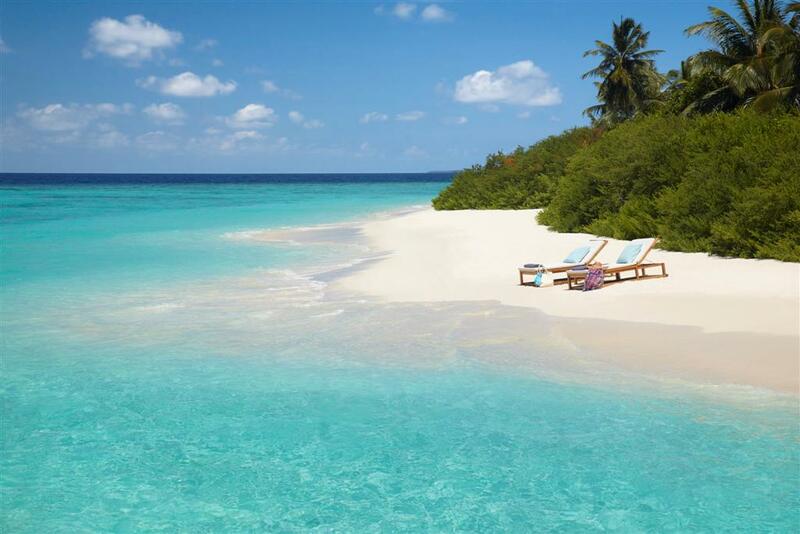 This astonishing resort is located 35 minute by seaplane from Malé, and boasts strikingly beautiful beaches as well as an excellent house reef. Added luxury comes in the form of sophisticated accommodation and fine cuisine from all over the world. 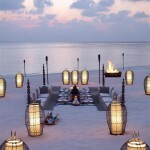 As far as Thai flavours in the Maldives goes, it doesn’t get much better than the fabulous Benjarong Restaurant. And if you prefer to wind down with a cocktail after endless hours of sunbathing and snorkeling, head to Sala Bar for amazing sunset views. 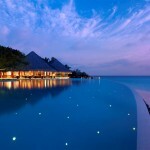 At Dusit Thani, Thai elegance meets Maldives architecture and creates the most captivating villas and residences. Each accommodation includes lovely outdoor rain showers, cable TV, BOSE sound system, free Wi-Fi and wine coolers. 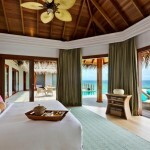 The Beach Villa (122 sqm) is spacious and located close to the stunning lagoon. 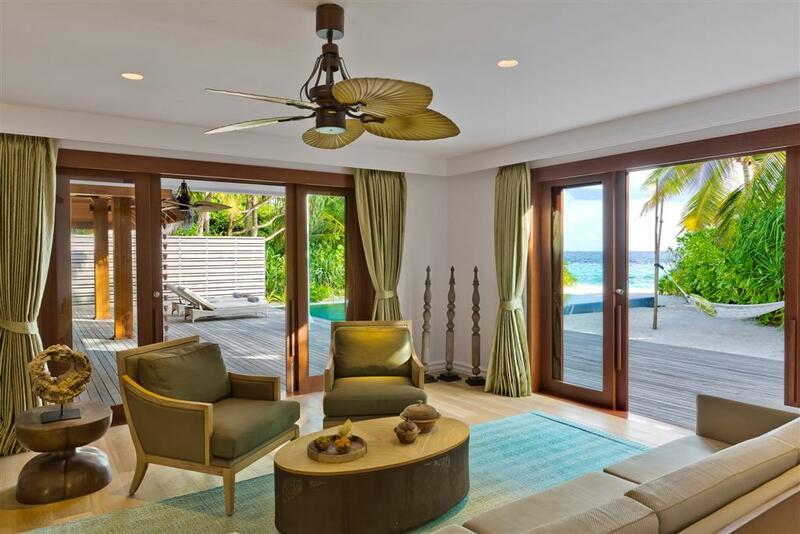 With its gorgeous interior and space, the Beach Villa offers great value for money. The outdoor seating area is the perfect spot to relax in the afternoon. 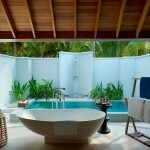 Modern amenities, an outdoor rain shower and Molton Brown toiletries are luxurious details of the Beach Villa. The Beach Villa with Pool (122 sqm) is the same size as the Beach Villa, but features your own private plunge pool with direct lagoon views. 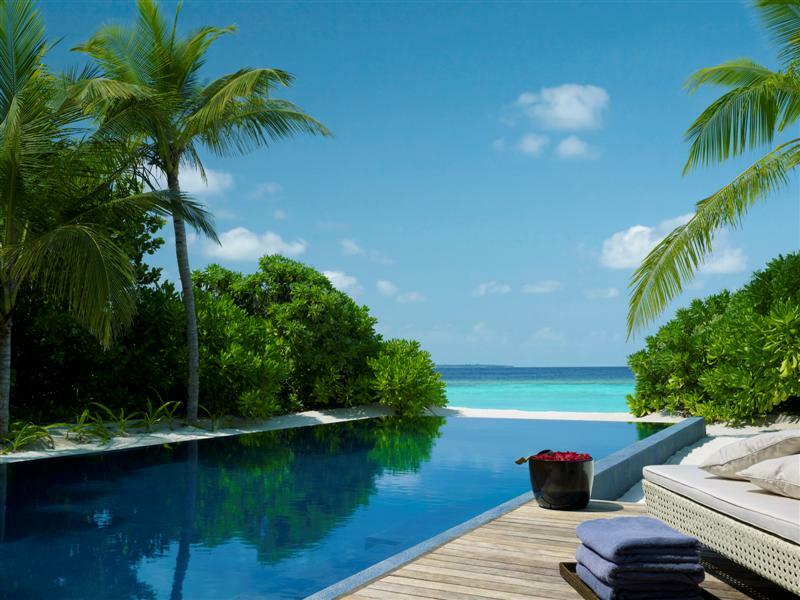 This romantic villa is stylishly designed and includes all modern amenities you need for a perfectly relaxing Maldives holiday. 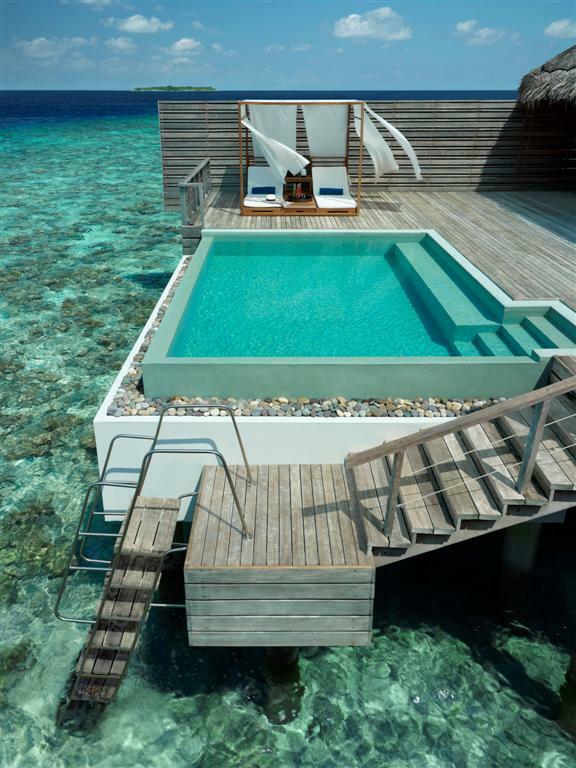 Apart from the lovely pool, there is an outdoor rain shower where you can cool off after a day in the sun. 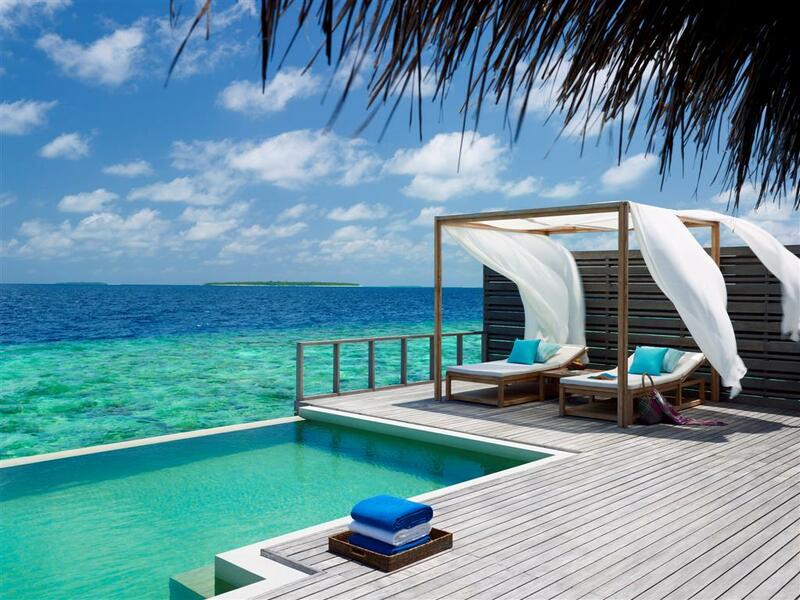 The Water Villa with Pool (up to 150 sqm) boasts lagoon access as well as beach access, giving you that ultimate Maldives sensation. 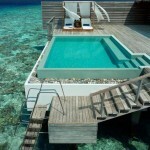 The Water Villa includes your own private plunge pool hovering above the turquoise waters of the Indian Ocean. You also have an outdoor rain shower and plenty of inside space. 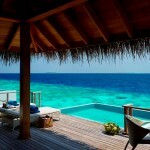 The Ocean Villa with Pool (180 sqm) takes luxury a bit further. Located just off the western shore, this spacious villa in contemporary Thai design stands above the lagoon, which you can climb directly into when you feel like a swim. 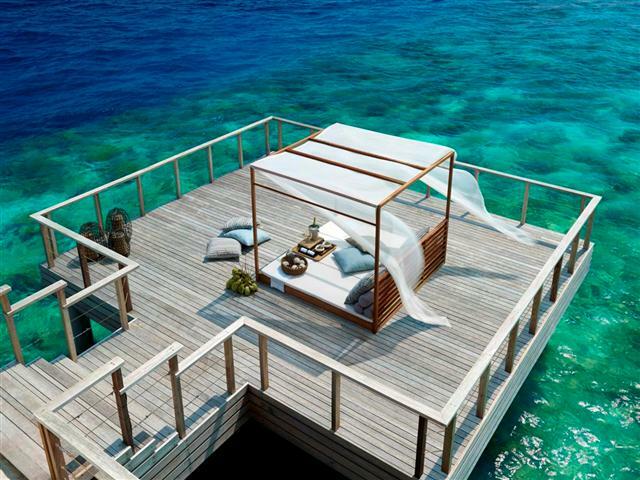 Your private sundeck has a plunge pool as well as comfortable sun loungers. Glass doors in your bedroom makes for amazing ocean views from the moment you wake up. 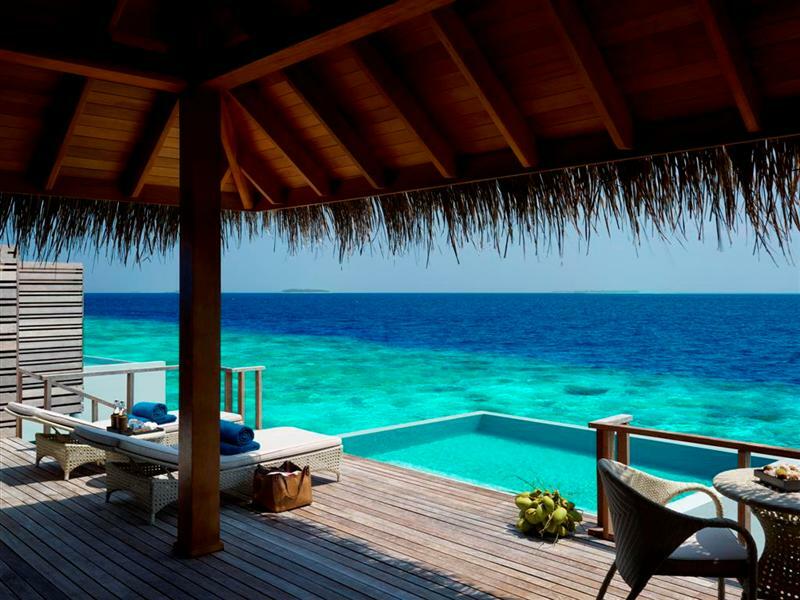 The Ocean Pavilion (370 sqm) is the epitome of holiday indulgence. With a luxurious master bedroom and a guest room, as well as a large outdoor deck for dining and sunbathing, the Ocean Pavilion would suit families or friends travelling together. 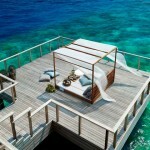 The private sundeck features a large swimming pool and a ladder leading down to the crystal clear Indian Ocean below. 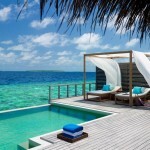 The Ocean Pavilion is the ideal choice if you want to pamper yourself to Thai luxury in gorgeous Maldives surroundings. The Beach Residence (560 sqm) on the western side of the island is the most spacious accommodation of Dusit Thani. 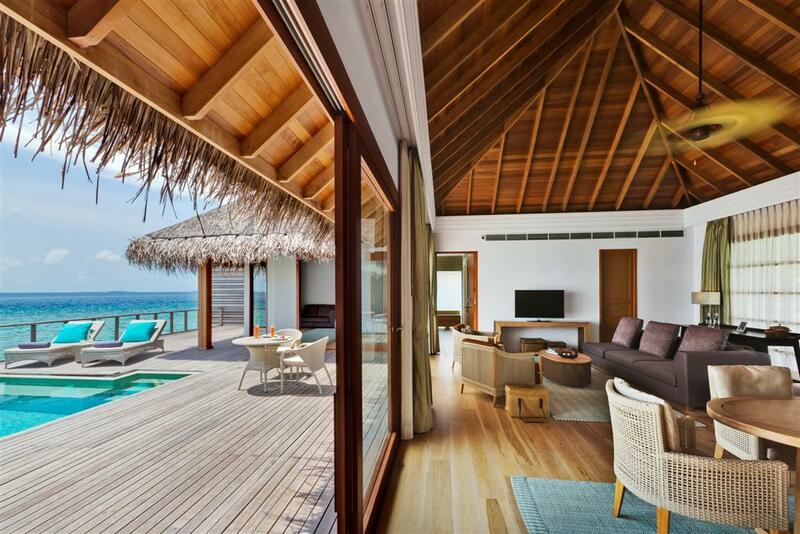 Featuring two lavish bedrooms (one with a king size bed and one with twin beds) and an appealing split level layout, the Beach Residence is the ideal choice if you need space on your Maldives holiday. The outside area boasts a large swimming pool, dining area and a lovely outdoor shower. 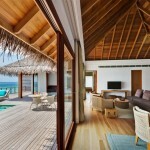 The Beach Residence also includes modern facilities and Molton Brown guest amenities. 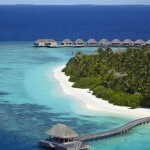 The largest swimming pool in the Maldives, floodlit tennis courts and onsite marine biologist? Dusit Thani boasts simply impressive facilities with an added touch of Thai luxury. When you’ve spent long hours on the strikingly beautiful beach, why not visit the island shop or perhaps work out with a personal trainer in the fitness studio? 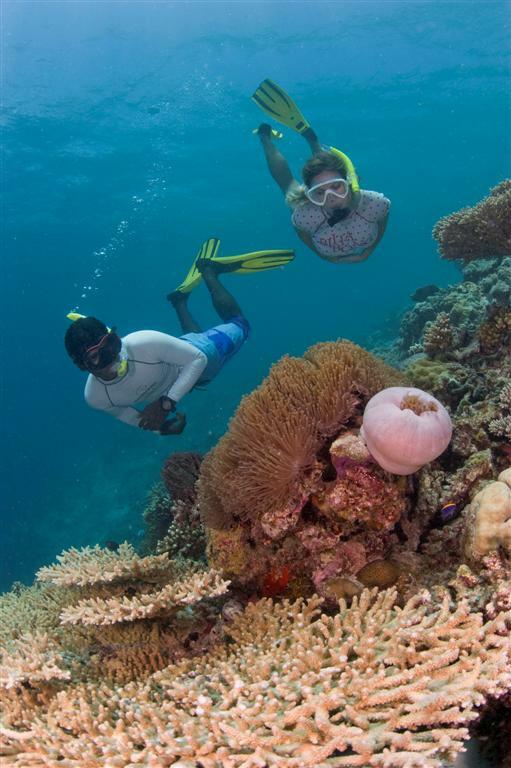 For those who prefer to explore the wonderful waters of the Indian Ocean, the resort offers complimentary snorkeling equipment while the Dive Centre is your chance to discover the fascinating world under the surface. For younger guests there are play areas available. 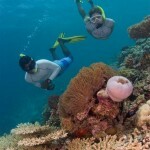 Dusit Thani also offers a wide range of water sports to be enjoyed by all the family. 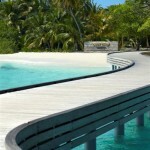 In addition, if you want to discover more of the gorgeous Baa Atoll the resort arranges regular excursions to other islands. If you’re lucky, you’ll even spot a dolphin or two! Deverana Spa means ‘Garden in Heaven’, which reflects in the spa philosophy. Pamper yourself to spa treatments surrounded by exquisite Thai design and complete serenity. 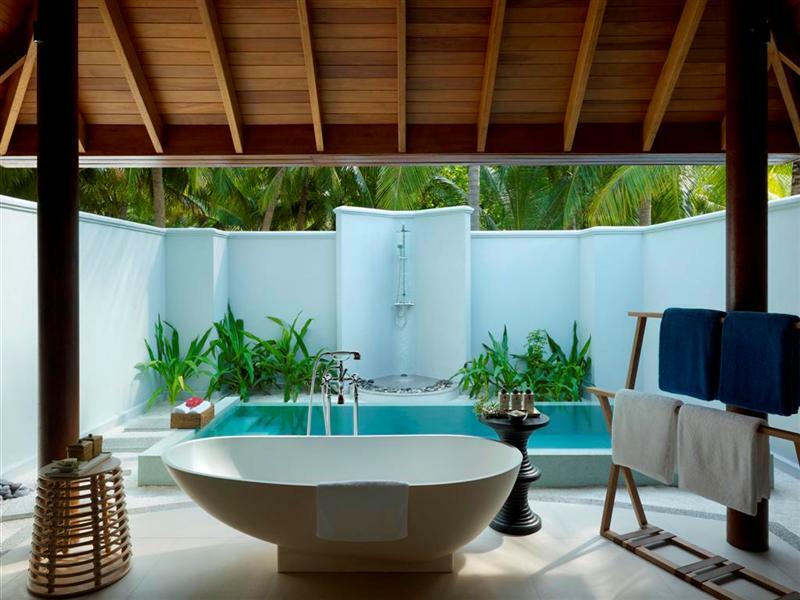 Coconut milk baths, ayurvedic massages and rose petal body scrubs will make you feel like a new person. For that ultimate relaxing experience, cool off in the private spa pool afterwards. No meal will ever be the same at Dusit Thani. This is where Thai and local flavours meet cuisine from the rest of the world, creating a wonderful treat for your taste buds. 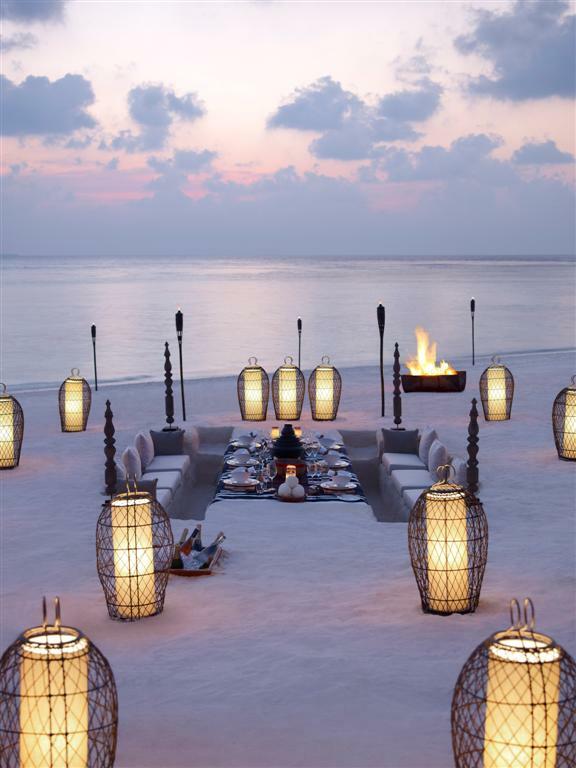 The ‘Borderless Dining’ experience, where you will be taken to magic secluded places on the island for a private dinner, is highly recommended. The Market close to the arrival jetty is the breakfast restaurant which serves cuisine from all over the world. Choose from organic delicacies, Chinese dim sum and exotic fruit for a tasty breakfast. Benjarong Restaurant is the signature restaurant of Dusit Thani, featuring Thai cuisine in a stunning setting. Enjoy a glass of fine wine and soak up the incredible views. Sea Grill is where you will head to enjoy freshly caught seafood, Mediterranean cuisine and Middle Eastern specialties. This restaurant prides itself in using organic ingredients and is located right by the stunning infinity pool on the west side of the island. Sand Bar is a relaxed venue where you can make new friends over a cocktail. 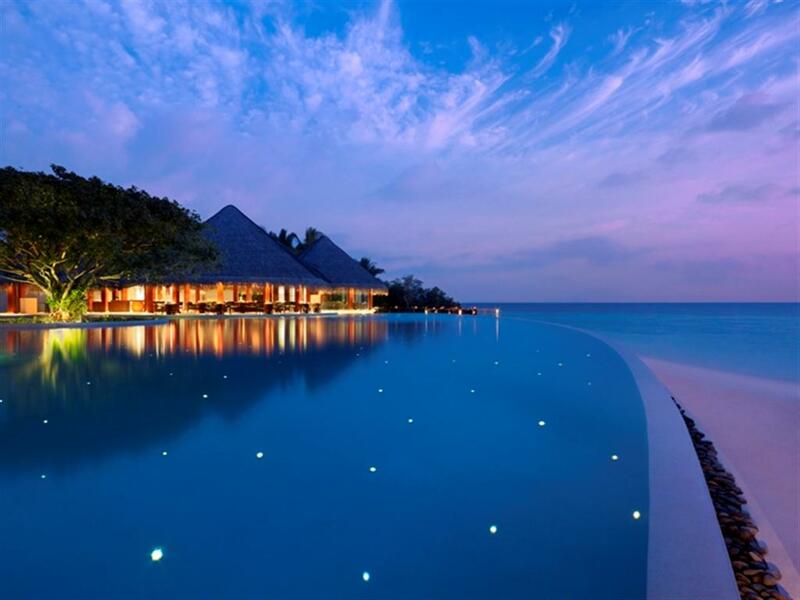 Its location by the pool makes the Sand Bar ideal for light lunches as well. 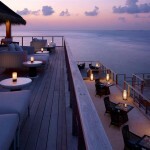 Sala Bar boasts the best views of the entire island, located in the same overwater complex as Benjarong. 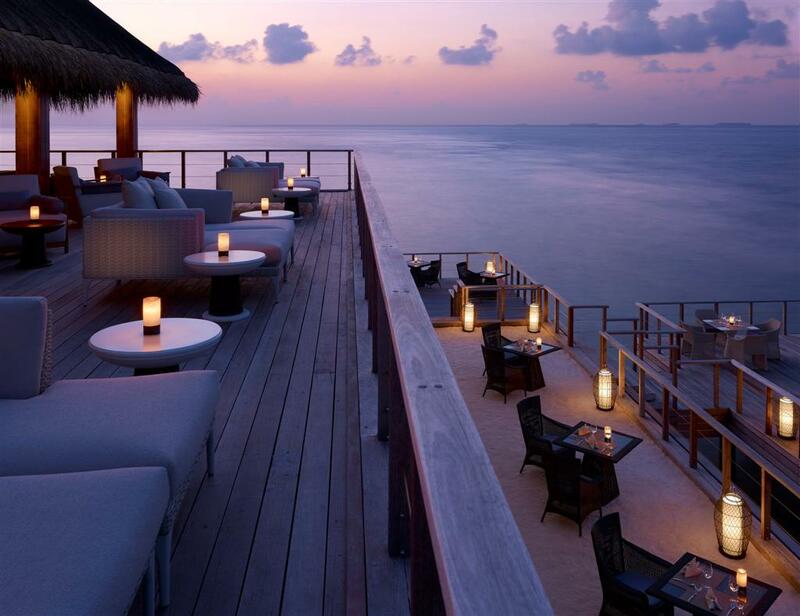 Try one of the Asian tapas with your exotic cocktail, while you indulge in views of the starry sky or the sunset. 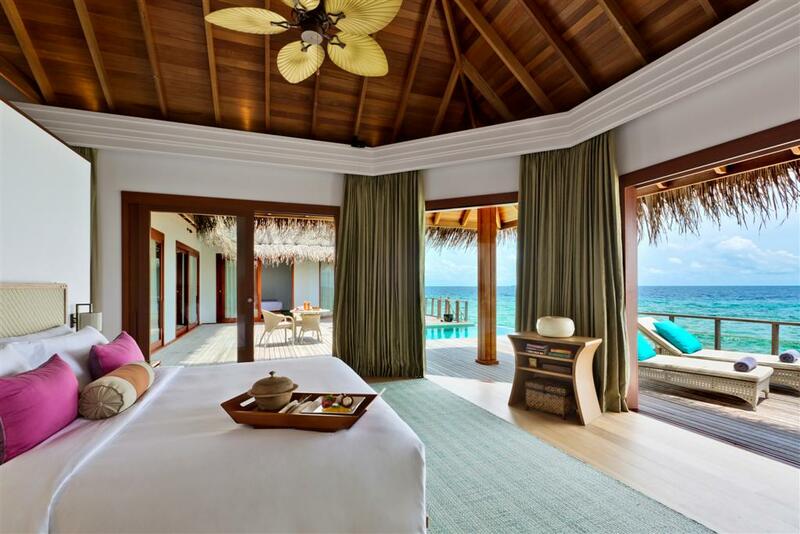 Simply Maldives Holidays offer a Bed and Breakfast package, a Half Board package and a Full Board package to guests staying at Dusit Thani.